Is there any connection between the Hebrew words nachash נחש - "snake", nichush ניחוש - "guess" and nechoshet נחושת - "copper"? They all appear to have the same root. However, it doesn't appear very likely that they are connected with each other. Let's take a closer look. The little children were playing at the edge of the clearing in front of their house. Suddenly their mother, horror struck, saw a snake near them, with lifted head, poised to strike. She hissed out to them sharply the warning sound חש (chash) imitating the very hiss of the snake. The children heard. They understood and ran to safety. From this warning syllable chash arose the Hebrew word for snake nachash. It's a bit fanciful, but I think it's reasonable to claim that nachash might have onomatopoeic origins. Other words ending in -chash also relate to sounds, like lachash לחש - "whisper"and rachash רחש - "rustle". Nichush (and the verb נחש) did not originally mean "guess". In biblical Hebrew it meant "divination" and was associated with magical practices. Only in modern Hebrew was it "secularized" to mean "guess." Klein points out that it is cognate with the Arabic nahisa and nahusa - "was unlucky". The Arabic form entered Hebrew slang as nachs נחס - "unlucky" or "bad". Regarding the etymology, Horowitz does connect nichush to nachash, saying that the divination was apparently done with snakes. However, Stahl, Klein and Kaddari all say that nichush is more likely related to lachash, since the diviners would whisper when reciting their incantations. The BDB mentions a theory that nichush derives from nachash, but rejects it because Aramaic has nichush, but does not have nachash meaning snake. Old English bræsen "of brass," from bræs "brass" + -en. The figurative sense of "hardened in effrontery" is 1570s (in brazen-face), perhaps suggesting a face unable to show shame. In modern Hebrew the word nachush does not always have the negative connotation, and instead can also mean "decisive, firm, steadfast." 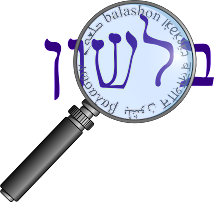 If you're wondering about the phrase נחש נחושת - nachash nechoshet found in Bamidbar 21:9, referring to a "copper snake", please take a look at my post from a few years ago about ish and isha. What we have here is a play on words, a pun - not any proof of an etymological connection.